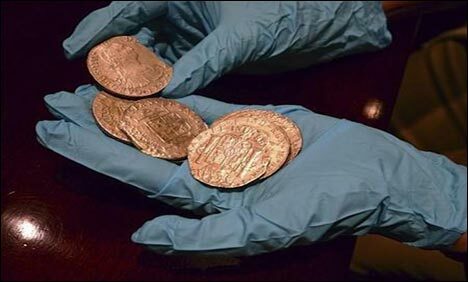 MADRID: Coins worth nearly half a billion dollars finally arrived in Spain on Saturday after lying in a sunken warship for more than 200 years and following a five-year legal battle between the Spanish government and a salvage company. In 1804, British warships attacked as the frigate was approaching the Spanish port of Cadiz and the ship went down, with 249 killed, a Spanish government website said. On Saturday, Spanish military aircraft landed at the Torrejon air force base near Madrid bearing 594,000 gold and silver coins recovered from the wreck by U.S.-based Odyssey Marine Exploration in 2007. Spain had argued in court that it, not the salvage company, was the rightful owner of the cargo and the ship, and a U.S. judge ordered on February 17 that the coins be returned from Florida. The company said it would abide by the ruling, although a spokeswoman said it "flies in the face of all legal precedent. "This a victory for Spain and the United States," lawyer Jose Maria Lancho, who advised the Spanish government in its action against Odyssey, told Reuters. "For Spain, this sunken ship, this archaeological site, is still a warship and we still have jurisdiction over what has happened to it." The Spanish government plans to restore, conserve and catalogue the contents of the 17-tonne cargo, which it estimates to be worth 373 million euros ($496 million). Several cities are vying to put the coins on show, but the culture minister said no decision had yet been taken. Spain has not said where it will keep the coins in the meantime, for security reasons. While the treasure is now in Spain, there is still legal action pending. Spanish news agency EFE reported the Peruvian government planned to appeal to the U.S. Supreme Court to claim part of the cargo. And Malaga-based marine archaeology company Nerea, which Lancho also works with, has been asking a Spanish court to bring charges against Odyssey of damage to cultural heritage, damage to archaeological sites and trafficking in archaeological heritage. Local media citing Spanish government sources reported part of the ship's cargo was still in Gibraltar, a British-administered territory in southern Spain whose sovereignty is disputed by the Spanish government.